Woodlots and Woodlot Licencees are small scale forest managers who strive to take a hands-on approach to natural resource management. Timber is harvested in a manner consistent with principles of stewardship and sustainability. Each year the Minister of Forests, Lands and Natural Resource Operations recognizes woodlot licensees in three different regions in the province, Northern Interior, Southern Interior, and the Coast as well as an overall provincial winner with an Award for Innovation and Excellence in Woodlot Management. The award program was introduced at the AGM in Quesnel, September 2010 with Pat Bell, Minister of Forests, Range and Mines, awarding $500 to Alex Hartford (Coastal recipient), Anne Davidson (Northern Interior recipient) and Rod Blake (Southern Interior recipient) in recognition of the “true legacies” these licensees created in woodlot management. To learn more about past recipients, click here. 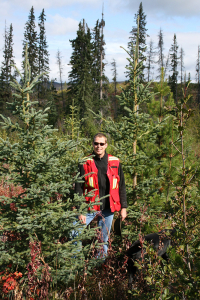 The Woodlot Product Development Council also recognizes a woodlot licensee or group of licensees for their stewardship or contribution to BC’s Woodlot Licence program each year. To view videos of past recipients, click here.